This season of Fifth Doctor adventures has put the companion at centre stage of the story. Last month’s Eldrad Must Die concentrated on Turlough and in The Lady of Mercia we have a very Tegan-centric story. I must admit that I am not Tegan’s biggest fan. On television I found the character to be rather annoying, but recently in the audio adventures I have warmed to her a lot more. This, I think, is down to the writing which has done the character more justice. Paul Magrs has written a tale which plays both to the character’s strengths and weaknesses. The Lady of Mercia is essentially a historical story framed within a science fiction context. The time machine built in the University laboratory is merely a device to propel some of our characters into the main story in the dark ages whilst sending another back to the future. Despite the implausibility (he says reviewing a Doctor Who story) that a university scientist could invent a time machine in 1983, it acts as a neat little device to move the story along. Magrs has taken what we know of the Dark Age Queen Æthelfrid and created an intriguing story that adds a few twists to the facts. He plays upon a familiar trope with the classic series’ historical stories where a member of the TARDIS crew ends up impersonating a figure from history. In this case it is central to Tegan’s progression through the story. How she reacts to being cajoled by Æthelfrid into impersonating her daughter to help her keep face with the people of Mercia is great fun. It is rather touching to see Tegan get so into her role that she starts looking upon Æthelfrid as a mother figure and dangerously adopts the Queen’s battles as her own. Janet Fielding’s performance is fantastic throughout and we see how Tegan’s impatient nature gets her into very serious trouble especially in the climactic scene in York Minster. The scene is one of impending disaster and the main cast do an excellent job of making us feel that it could all go horribly wrong at any second. The supporting cast is tremendous, the highlight being Rachel Atkins who’s no-nonsense portrayal as Æthelfrid is both witty and incredibly powerful. The other members of the cast do have some fun sub plots to play with, such as student protests and illicit student / lecturer affairs - one of which Turlough is amusedly caught in the middle of. They are lovely moments of comedy in amongst the grand and tense historical drama being played out. 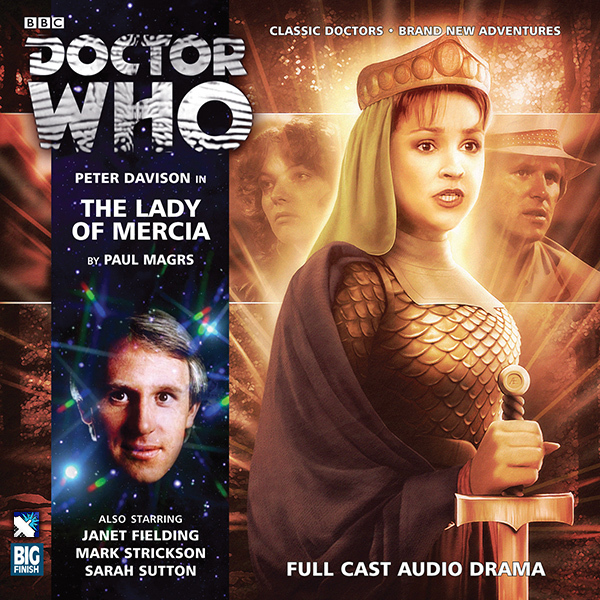 The Lady of Mercia is a very entertaining adventure and a great chapter in this latest trilogy for The Fifth Doctor.